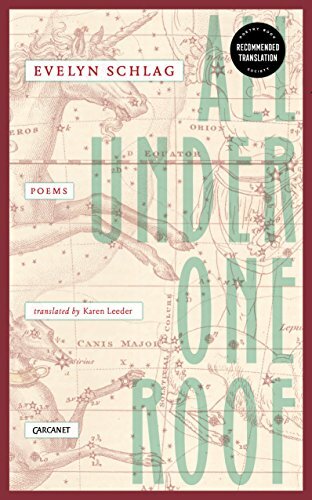 Evelyn Schlag’s All Under One Roof captivates the reader using conversational prose, and a pattern of discovery in the innocent encounter of the places and the experiences that the speaker of the poem grows through. Translated by Kareen Leeder with a fine touch, the collection draws from her two German-language collections – Language of a different stripe (Sprache von einem anderen Holz, 2008) and Racing in Slo-mo (verlangsamte raserei, 2014) – in which love is a key theme, but written with a harsh and snappy edge. There are no sentimental clichés; rather, Schlag writes with such a straightforwardness that makes the themes both intimate and familiar. The collection gives an insight to Schlag’s creative vision and the role of poetry in a political world. She takes boundless chances with love, politics and memory, creating an inward journey with a new language to fuse the sublime with the mundane, and exploring how love unfolding in the language of the poetry shapes our thinking and feeling ‒ be it in relation to nature and art, body and mind, individual or in the presence of either woman or man. In “Where our Skin” Schlag describes the intimacy of the landscape itself. Before autumn we had not given ourselves to each other. These lines bring out the very essence of love and human nature. The love story in this poem becomes so much more than just two people as Shlag not only compares the love to the nature, merging with it. The claim of the poems, such as “St. Petersburg: the Poem”, is nevertheless immense. In a beautiful city as St. Petersburg, this “most imaginary city!” is loved by the female narrator-traveller, making an art shaped by desire, which enhances the city’s beauty. The poem, leaves the reader reacting to the poem as an experience. Just like the subtitle (‘the Truth) suggests, you have to take your time with Schlag’s poems; they ‘claim’ the reader, demand that she feels their pulse as if they were material beings rather than mere writing, thus suggesting the notion that the poems are about love in its myriad manifestations. They have the potential for time travel, taking the reader through the theme of travelling ‒ physical impressions from Rome and New York. Once read, the poems claim a permanent place in the reader’s mind. They demand to be reread and considered, not just brushed away as something unusual. In this world where politics and art speak of creativity, poetry should not be too easily consumed. The collection reflects a soul, or a way of living your life ‒ to be your greater self, greater than what we have. The collection makes you as a reader relieved to know you are not the only one trying to make sense out of life but to feel that we are, as the title suggests, all under one roof.